SC stands for Subscriber Connector. SC connector offers excellent packing density, and its push-pull design resists fiber end face contact damage. SC connector are inexpensive, trouble-free, and robust. SC connectors give precise positioning via their ceramic ferrules. The square, snap-in connector latches with a simple push-pull motion and is keyed. SC optical connector has a 2.5mm ferrule and molded housing for shielding. it has a 1000 mating cycles and have an insertion loss of 0.25 dB. 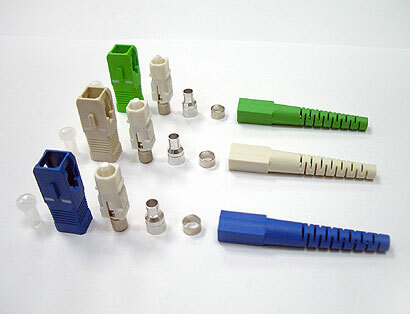 SC connector house kits without ferrule are available. SC/PC and SC/APC are available.